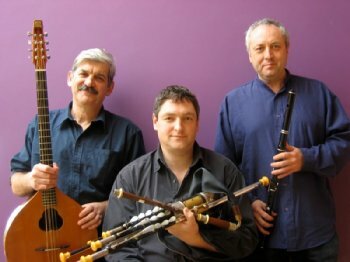 Cran, those masters of Irish folk music and song, will be performing in the Octagon, University of Ulster, Coleraine, on Tuesday 28 February at 8pm. The performance forms part of the Cultural Crossings: Ulster Scots & Celtic Traditions Across the Continents programme of events which will take place over the coming weeks in the Coleraine, Limavady, Ballymoney and Moyle Council areas. The trio of Ronan Browne (uilleann pipes and flute), Desi Wilkinson (flute) and Sean Corcoran (singer and bouzouki player), each enjoy an international reputation in their own field (Ronan was the original piper with Riverdance) and together deliver a dazzling display of technical virtuosity combined with fun and humour, banter and stories. The core of their repertoire is their native Irish material: bubbling dance music, or haunting slow airs on flute and pipes and vocals ranging from the highly-ornamented sean-nÃ³s songs of Connemara to the rollicking mouth music of Donegal. Their Hiberno-English repertoire (songs from Ireland in English) covers the entire gamut from old story-telling, long ballads to lively comic songs of pure devilment and rascality. They also include material from the Scots-Gaelic and Breton traditions. Cultural Crossings emerged as the result of a partnership between the Provost of the University of Ulster’s Coleraine campus and Causeway Arts Committee and is committed to the promotion of arts events for local communities. Irish and Ulster-Scots traditions have enriched the music, dance and art of many regions throughout the world and with this in mind, Cultural Crossings celebrates the musical and artistic influence of emigrants from Ireland on their new homelands. Events include include folk, pop, country, bluegrass, harp and traditional music as well as film, talks and storytelling. Major music performances not-to-be-missed include, Grammy-nominated, folk/country legend, Gretchen Peters, on Wednesday 14 March, at the Roe Valley Arts and Cultural Centre and the dynamic Broken String Bluegrass Band, who play the Riverside Theatre on Saturday 17 March, St Patrick’s Night. *Cran at The Octagon, University of Ulster, Coleraine, takes place on Tuesday 28 February 2012, at 8pm. Admission is £8. Concession £6. Students and Jobseekers £4. For details of all Cultural Crossings events, visit: www.culture.ulster.ac.uk or contact the Development and Alumni Relations Office at the University of Ulster on (028) 7012 4683.